A bunch of genealogy bloggers are "tagging" other genealogy bloggers (as in "you're it") to get them to write a blog post where you list 5 things about yourself that your blog readers probably don't know. I've been tagged 3 times (! ), first by Randy Seaver, then by George Morgan and Rick Crume. Since the main purpose of this blog is to help people find their ancestors I see no point in boring you with this sort of silliness. But! I did come up with one thing you may not know about me that might indirectly help you find something about your ancestors: I used to have a dog named Monster. The idea for the website was to help Americans with German ancestors find their roots, but the site soon went a little off the original topic, and it now has a few sections devoted to American genealogy in general. My Death Indexes and Records website was originally a single webpage on the German Roots website that got out of hand. Same thing happened with my Military Indexes and Records website. The Online Passenger Lists webpage is still there on the German Roots website. See? 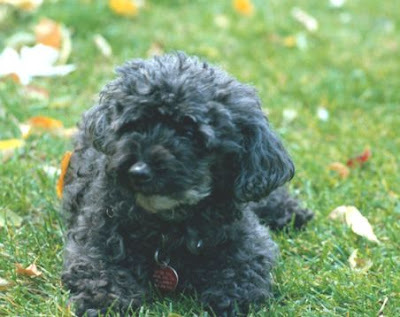 Maybe my dog was able to help you find something about your ancestors (insert smiley face here). Here's a picture of the wee Monster contemplating her legendary status. As you can see, she was a totally ferocious beast so you better be afraid (insert another smiley face here). Now go find some ancestors! This article was updated on 9 September 2010. 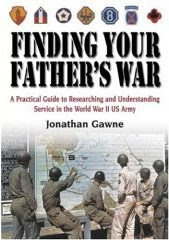 If you have an ancestor or relative who served in the Army during World War II here is an entire book about researching records of individual soldiers and Army units. The book is divided into five distinct sections. The first section, "Introduction to Army Units," discusses rank, branches of service and unit size. Don't know the difference between a squad, a platoon, a battalion, etc? Here's where to find out. A subsection on rank covers enlisted men, technicians and officers. For each rank (private, sergeant, etc) the insignia is shown along with the base pay. Section two describes the types of records kept for an individual soldier and explains the Army's serial number system. There's even an illustration of a soldier's dog tag, explaining what each line and code means. Section three describes organizational records for army units. The fourth section, "Finding Records," tells you where to look for many of the records discussed in the book. Here you can learn about using the Freedom of Information Act, the 1973 fire at the National Personnel Records Center in St. Louis, the National Archives, Veterans Affairs records, and other topics. The author lets you know that some records are only available to next of kin, while others may be public domain and available to anyone. The last section has all sorts of useful information and illustrations of insignias, badges, uniforms and medals - things you might find in the attic and are wondering what they mean. Insignias for WWII Armies, Army Groups, Corps, Major Army Commands, the Army Air Force, and Divisions (Infantry & Airborne, Armored, and Cavalry) are shown in appendices. Most of the book's illustrations are in color. Overall this book contains a wealth of information about a soldier's World War II Army service and how you can find many of the records that have survived. I found it to be a nice resource for U.S. Army WWII genealogy research. Ancestry has recently added online images and a partial index to the Hamburg, Germany passenger departure records from 1850-1934 (except: 1 January--14 July 1853, which are missing, and the WWI years of 1915-1919). The years 1890-1913 have been indexed so far. These lists can be helpful if you have an immigrant ancestor who left from Hamburg because they usually give the place (town or city) of residence for the passengers.